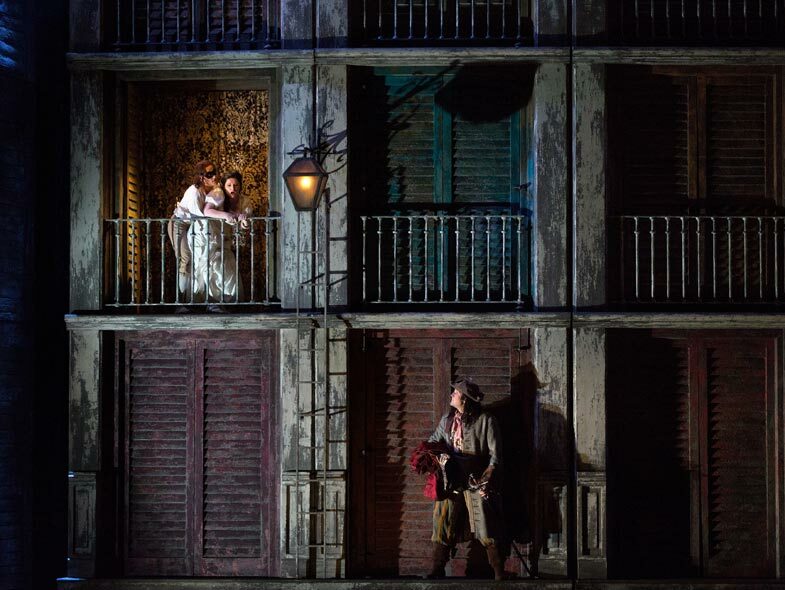 TOSCA : Puccini Original Air Date: 04/06/2019 Rizzi; Rowley, Calleja, Koch, Cokorinos Program 040619-Tosca Conductor Carlo Rizzi Cesare Angelotti Oren Gradus A Sacristan Philip Cokorinos Mario C avaradossi Joseph Calleja Floria Tosca Jennifer Rowley Baron … Continue reading "TOSCA"
RUSALKA:Dvorák Original Air Date: 12/11/1993 Fiore; Benacková, Heppner, Martin, Toczyska, Koptchak MOD Audio SID.19150101 This is from the first Met season for Rusalka and Benackova is a worthy heroine. 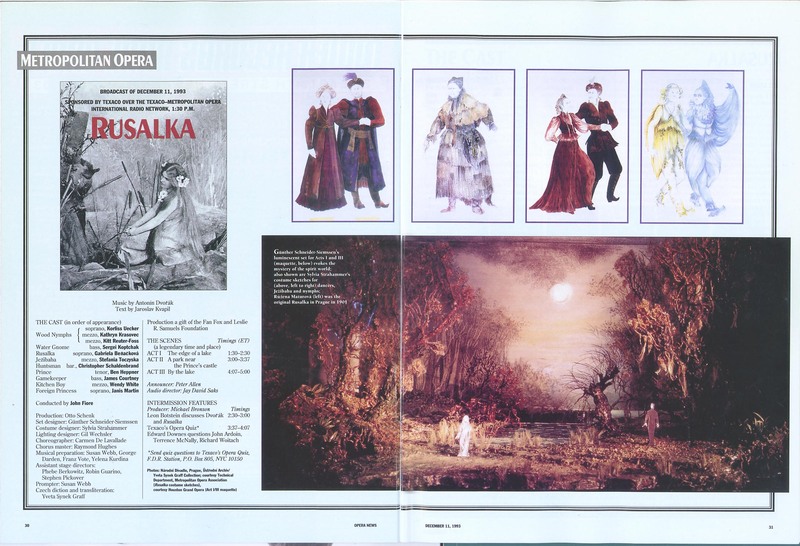 For the broadcast a young Ben … Continue reading "RUSALKA"
DIE WALKÜRE:Wagner Original Air Date: 02/24/1968 Klobucar; Nilsson, Stewart, Rysanek, Vickers, Ludwig, Ridderbusch MOD Audio SID.19150103 This performance has been issued on Sony Historic CD, and certainly has the cream of the crop of contemporary … Continue reading "DIE WALKÜRE"
DIE WALKÜRE:Wagner Original Air Date: 02/24/1968 Klobucar; Nilsson, Stewart, Rysanek, Vickers, Ludwig, Ridderbusch MOD Audio SID.19150104 This performance has been issued on Sony Historic CD, and certainly has the cream of the crop of contemporary … Continue reading "DIE WALKÜRE"
OTELLO:Verdi Original Air Date: 03/08/1958 Cleva; Del Monaco, de los Angeles, Warren, Franke MOD Audio SID.19150105 This is a splendid performance, and should also note the number of fine Otellos which have not been on … Continue reading "OTELLO"
L’ELISIR D’AMORE:Donizetti Original Air Date: 03/14/1981 Rescigno; Pavarotti, Blegen, Bruscantini, Ellis SID.19150106 This cast is represented (at least Blegen and Pavarotti) as far back as 1974 AND 1978 for on Met Opera on Demand (MOoD) … Continue reading "L’ELISIR D’AMORE"
NORMA:Bellini Original Air Date: 03/17/1979 Maag; Verrett, Obraztsova, Cossutta, Plishka SID.19150107 Verrett was a very fine Norma, but this broadcast marks her first in house Met Norma returning after indisposition on the opening night; Marisa … Continue reading "NORMA"
NABUCCO:Verdi Original Air Date: 12/03/1960 Schippers; MacNeil, Rysanek, Siepi, Fernandi MOD Audio SID.19150208 MacNeil and Siepi are both excellent in the Met’s first Nabucco production. 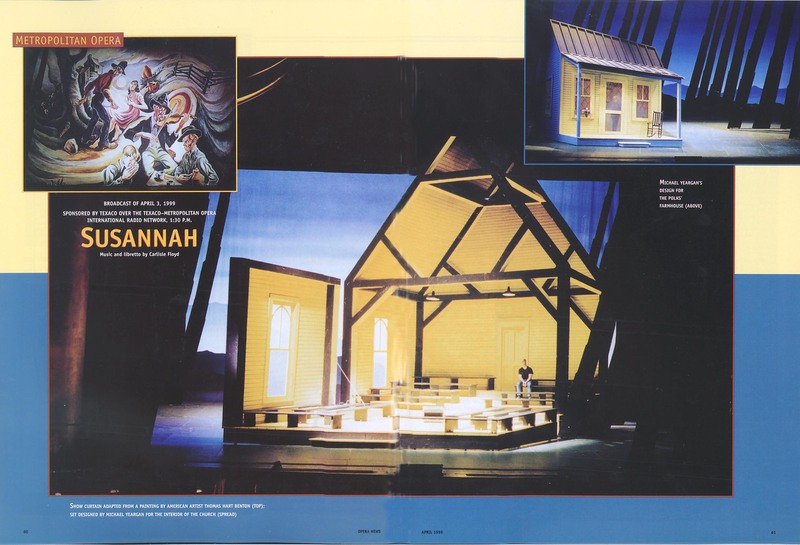 Rysanek gives her all, but really not the right match … Continue reading "NABUCCO"
HAMLET:Thomas Original Air Date: 03/27/2010 Langrée; Keenlyside, Petersen, Larmore, Morris, Spence MOD Video SID.19150209 This is the only Met broadcast of the Thomas work. 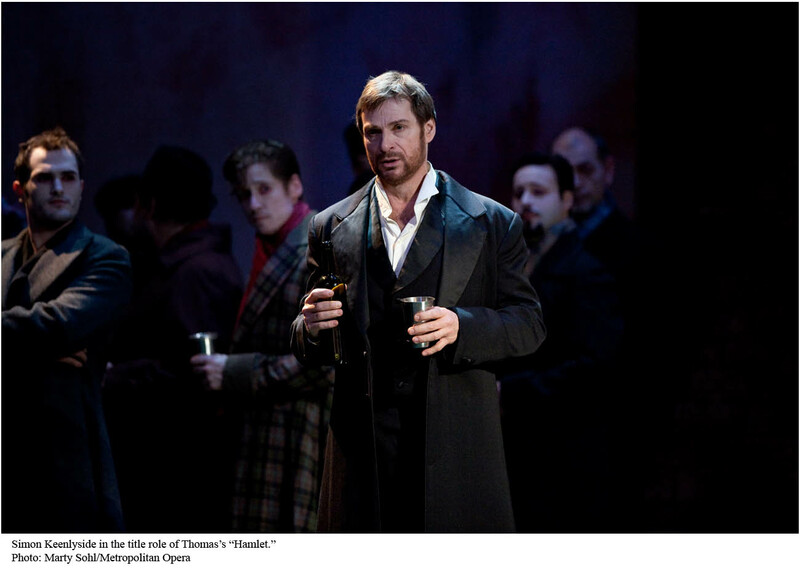 Keenlyside has a commercial DVD in the same production with Dessay … Continue reading "HAMLET"
LA FORZA DEL DESTINO:Verdi Original Air Date: 03/24/1984 Levine; Price, Giacomini, Nucci, Giaiotti, Jones, Fissore SID.19150211 This is a 3 performance group intended to capture the Price Leonora on video ; fall performances had featured … Continue reading "LA FORZA DEL DESTINO"
DER ROSENKAVALIER:Strauss Original Air Date: 02/20/1993 Thielemann; Liang, Tomowa-Sintow, Rootering, Grant Murphy, Schulte SID.19150212 Thielemann conducts a lovely performance with Tomowa-Sintow in her Met broadcast farewell. 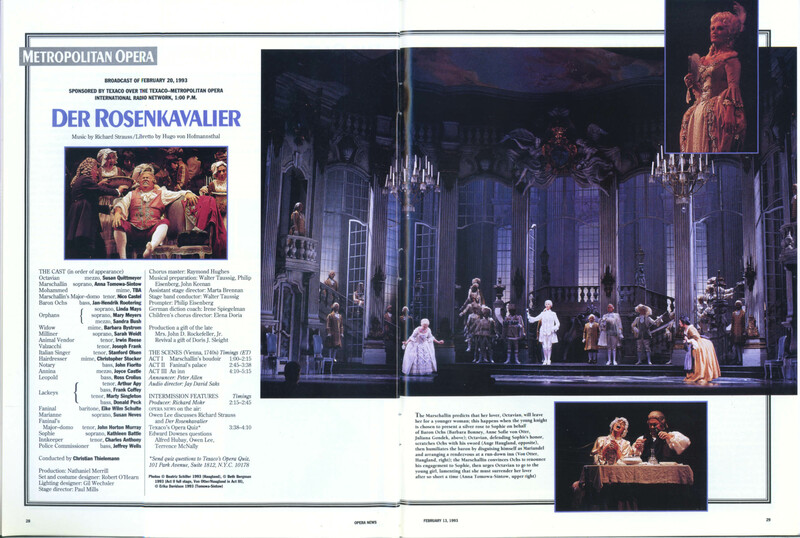 Liang was a two performance replacement for Mentzer and … Continue reading "DER ROSENKAVALIER"
Various:Various Original Air Date: 01/01/9999 Various Artists SID.19150213 Various selections between scheduled operas. Siriusxm Radio and web player will show the Composer and Title. 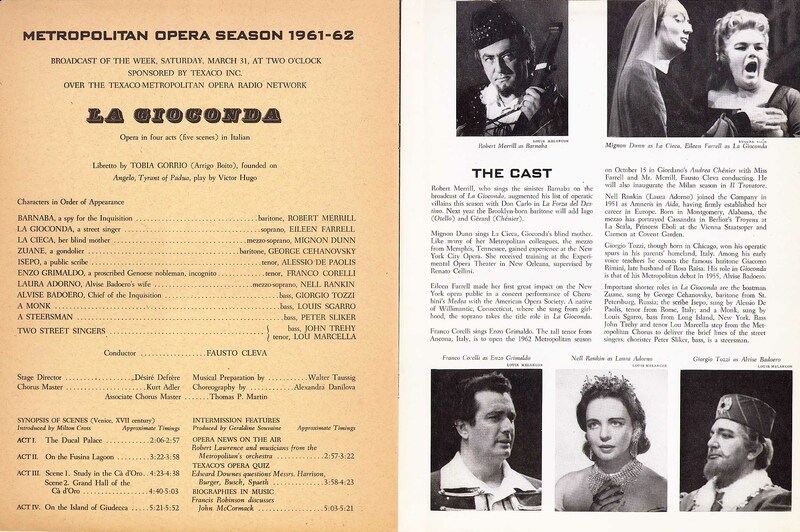 LA GIOCONDA:Ponchielli Original Air Date: 03/31/1962 Cleva; Farrell, Corelli, Merrill, Rankin, Tozzi SID.19150315 Here is why I love the current Sirius service for Met repertory : The fall performances went unbroadcast. 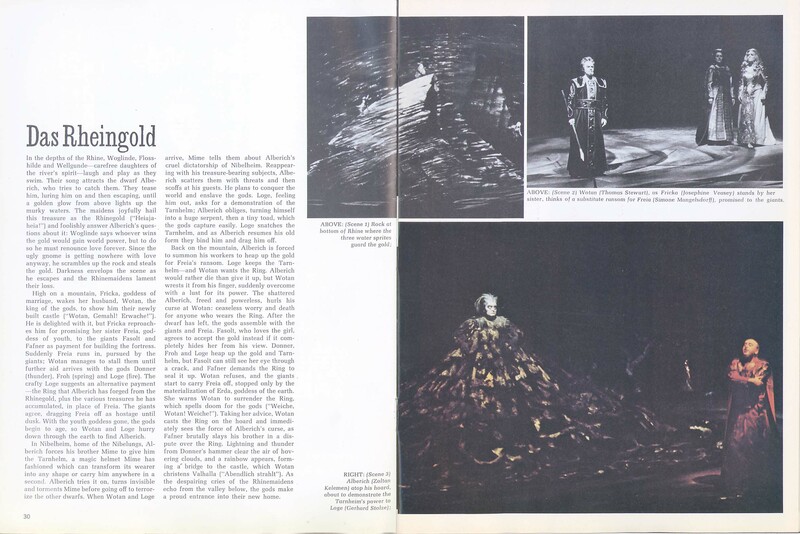 This 19700/71 Hoffmann was … Continue reading "LA GIOCONDA"
ORFEO ED EURIDICE:Gluck Original Air Date: 03/10/1962 Morel; Meyer, Amara, Rothenberger SID.19150316 This is Meyer’s broadcast debut (she appears the following season in the Met’s first round of Ariadnes. 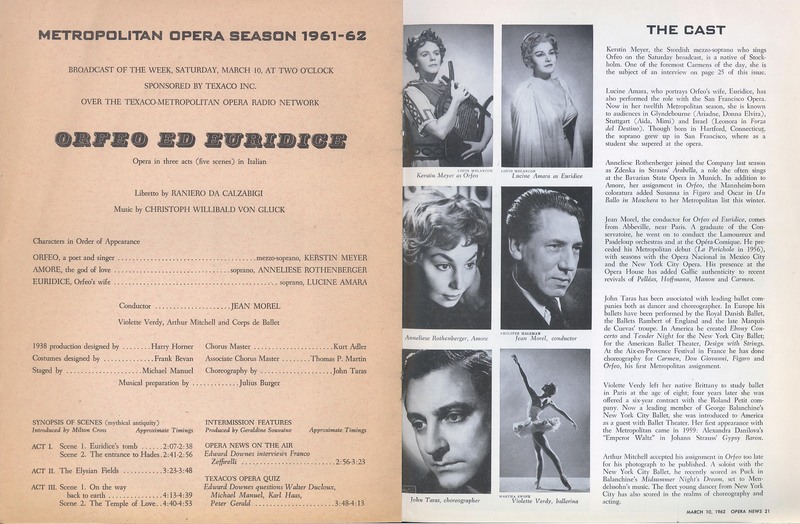 I like my Orfeo with more … Continue reading "ORFEO ED EURIDICE"
ARIADNE AUF NAXOS:Strauss Original Air Date: 01/05/1985 Davis; Norman, Cochran, Rolandi, Ewing, Weller, Duesing SID.19150317 This is Ms. Norman’s first season at the Met in her most frequent assumption. 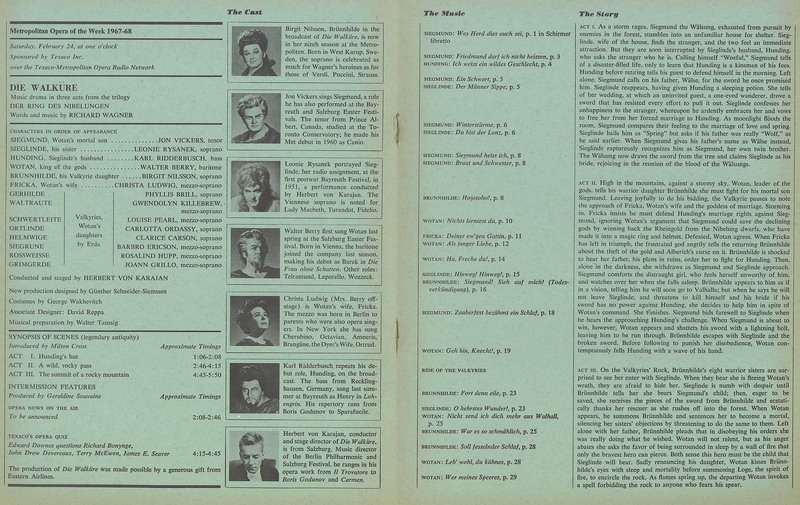 Cochran makes his Met farewell in … Continue reading "ARIADNE AUF NAXOS"
DIE WALKÜRE:Wagner Original Air Date: 02/24/1968 Klobucar; Nilsson, Stewart, Rysanek, Vickers, Ludwig, Ridderbusch MOD Audio SID.19150319 This performance has been issued on Sony Historic CD, and certainly has the cream of the crop of contemporary … Continue reading "DIE WALKÜRE"
DIE WALKÜRE:Wagner Original Air Date: 02/24/1968 Klobucar; Nilsson, Stewart, Rysanek, Vickers, Ludwig, Ridderbusch MOD Audio SID.19150320 This performance has been issued on Sony Historic CD, and certainly has the cream of the crop of contemporary … Continue reading "DIE WALKÜRE"
OTELLO:Verdi Original Air Date: 03/08/1958 Cleva; Del Monaco, de los Angeles, Warren, Franke MOD Audio SID.19150321 This is a splendid performance, and should also note the number of fine Otellos which have not been on … Continue reading "OTELLO"
LA FORZA DEL DESTINO:Verdi Original Air Date: 03/24/1984 Levine; Price, Giacomini, Nucci, Giaiotti, Jones, Fissore SID.19150422 This is a 3 performance group intended to capture the Price Leonora on video ; fall performances had featured … Continue reading "LA FORZA DEL DESTINO"
LA GIOCONDA:Ponchielli Original Air Date: 03/31/1962 Cleva; Farrell, Corelli, Merrill, Rankin, Tozzi SID.19150423 Here is why I love the current Sirius service for Met repertory : The fall performances went unbroadcast. 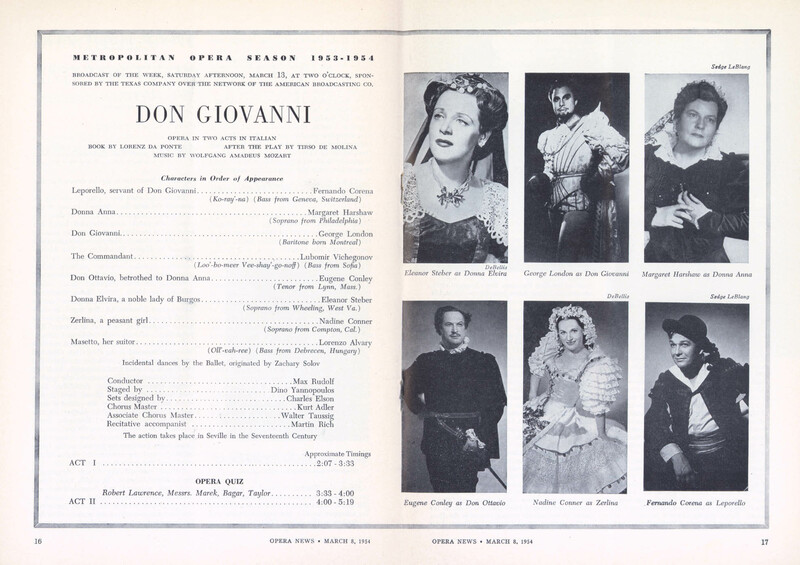 This 19700/71 Hoffmann was … Continue reading "LA GIOCONDA"
NABUCCO:Verdi Original Air Date: 12/03/1960 Schippers; MacNeil, Rysanek, Siepi, Fernandi MOD Audio SID.19150424 MacNeil and Siepi are both excellent in the Met’s first Nabucco production. 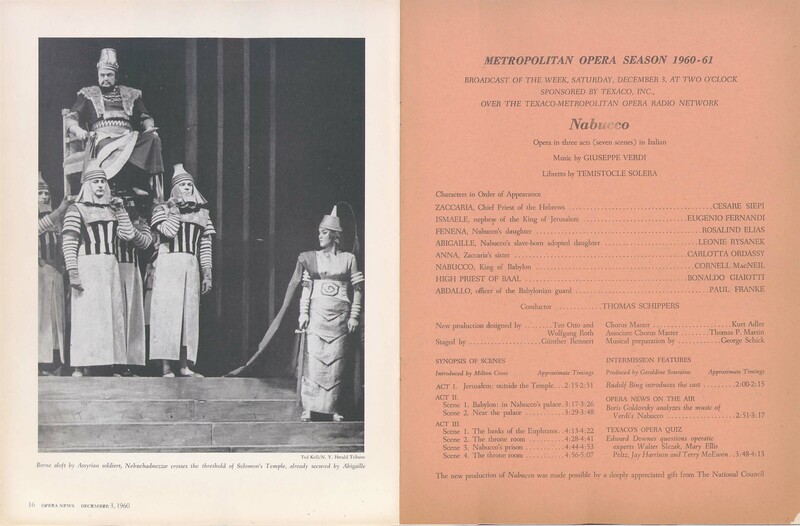 Rysanek gives her all, but really not the right match … Continue reading "NABUCCO"
HAMLET:Thomas Original Air Date: 03/27/2010 Langrée; Keenlyside, Petersen, Larmore, Morris, Spence MOD Video SID.19150425 This is the only Met broadcast of the Thomas work. 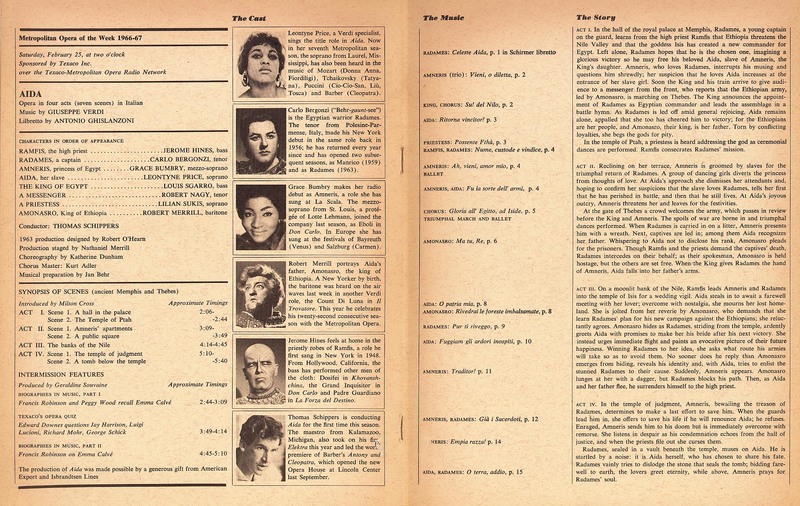 Keenlyside has a commercial DVD in the same production with Dessay … Continue reading "HAMLET"
LA FORZA DEL DESTINO:Verdi Original Air Date: 03/24/1984 Levine; Price, Giacomini, Nucci, Giaiotti, Jones, Fissore SID.19150427 This is a 3 performance group intended to capture the Price Leonora on video ; fall performances had featured … Continue reading "LA FORZA DEL DESTINO"
DER ROSENKAVALIER:Strauss Original Air Date: 02/20/1993 Thielemann; Liang, Tomowa-Sintow, Rootering, Grant Murphy, Schulte SID.19150428 Thielemann conducts a lovely performance with Tomowa-Sintow in her Met broadcast farewell. 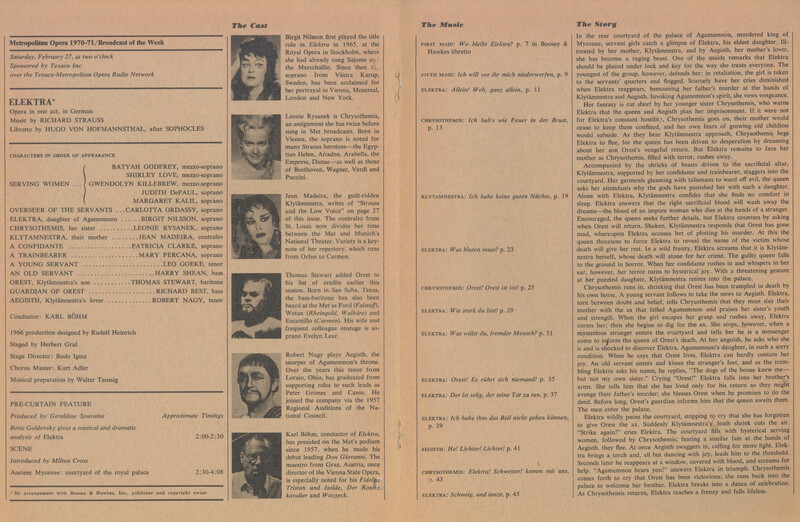 Liang was a two performance replacement for Mentzer and … Continue reading "DER ROSENKAVALIER"
ORFEO ED EURIDICE:Gluck Original Air Date: 03/10/1962 Morel; Meyer, Amara, Rothenberger SID.19150529 This is Meyer’s broadcast debut (she appears the following season in the Met’s first round of Ariadnes. 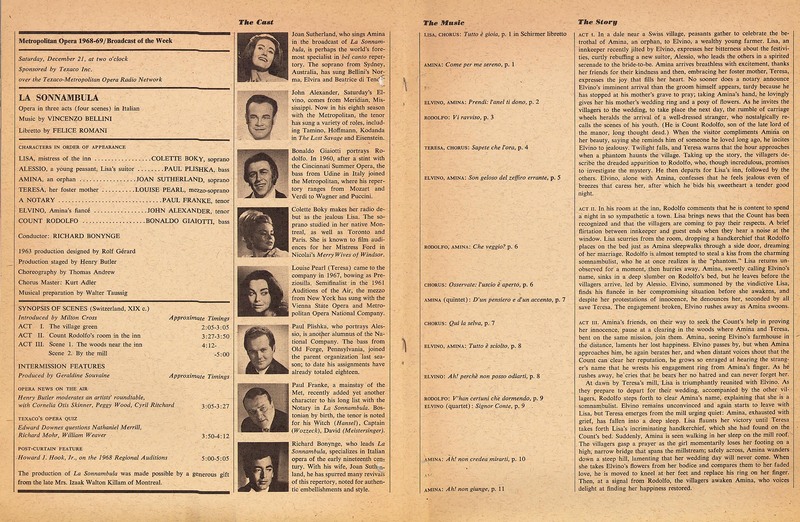 I like my Orfeo with more … Continue reading "ORFEO ED EURIDICE"
L’ELISIR D’AMORE:Donizetti Original Air Date: 03/14/1981 Rescigno; Pavarotti, Blegen, Bruscantini, Ellis SID.19150530 This cast is represented (at least Blegen and Pavarotti) as far back as 1974 AND 1978 for on Met Opera on Demand (MOoD) … Continue reading "L’ELISIR D’AMORE"
NORMA:Bellini Original Air Date: 03/17/1979 Maag; Verrett, Obraztsova, Cossutta, Plishka SID.19150531 Verrett was a very fine Norma, but this broadcast marks her first in house Met Norma returning after indisposition on the opening night; Marisa … Continue reading "NORMA"
OTELLO:Verdi Original Air Date: 03/08/1958 Cleva; Del Monaco, de los Angeles, Warren, Franke MOD Audio SID.19150532 This is a splendid performance, and should also note the number of fine Otellos which have not been on … Continue reading "OTELLO"
ARIADNE AUF NAXOS:Strauss Original Air Date: 01/05/1985 Davis; Norman, Cochran, Rolandi, Ewing, Weller, Duesing SID.19150533 This is Ms. Norman’s first season at the Met in her most frequent assumption. 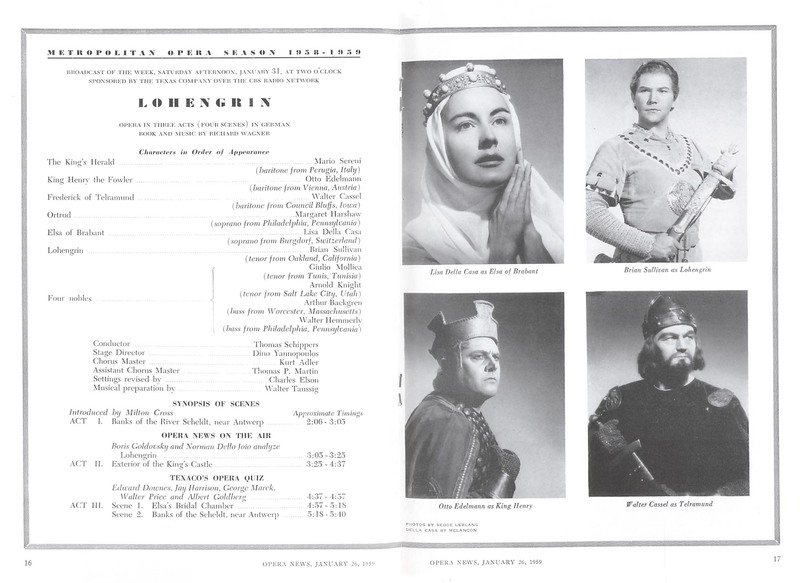 Cochran makes his Met farewell in … Continue reading "ARIADNE AUF NAXOS"
DIE WALKÜRE:Wagner Original Air Date: 02/24/1968 Klobucar; Nilsson, Stewart, Rysanek, Vickers, Ludwig, Ridderbusch MOD Audio SID.19150535 This performance has been issued on Sony Historic CD, and certainly has the cream of the crop of contemporary … Continue reading "DIE WALKÜRE"
DIE WALKÜRE:Wagner Original Air Date: 02/24/1968 Klobucar; Nilsson, Stewart, Rysanek, Vickers, Ludwig, Ridderbusch MOD Audio SID.19150636 This performance has been issued on Sony Historic CD, and certainly has the cream of the crop of contemporary … Continue reading "DIE WALKÜRE"
OTELLO:Verdi Original Air Date: 03/08/1958 Cleva; Del Monaco, de los Angeles, Warren, Franke MOD Audio SID.19150637 This is a splendid performance, and should also note the number of fine Otellos which have not been on … Continue reading "OTELLO"
ORFEO ED EURIDICE:Gluck Original Air Date: 03/10/1962 Morel; Meyer, Amara, Rothenberger SID.19150638 This is Meyer’s broadcast debut (she appears the following season in the Met’s first round of Ariadnes. 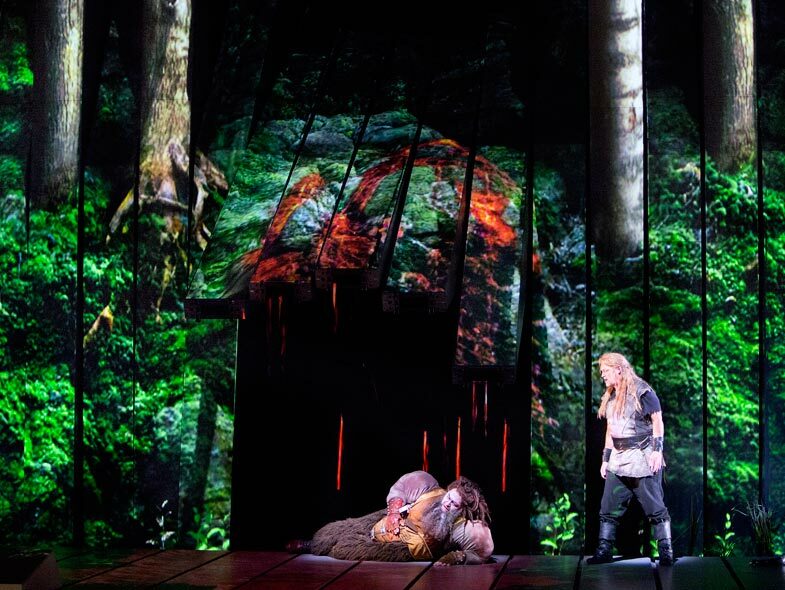 I like my Orfeo with more … Continue reading "ORFEO ED EURIDICE"
SIEGFRIED:Wagner Original Air Date: 04/13/2019 Jordan; Goerke, Morley, Cargill, Vinke, Siegel, Volle, Konieczny, Belosselskiy SID.19150639 SEASON PREMIERE Program 041319-Siegfried Conductor ………. Philippe Jordan Mime ………. Gerhard Siegel Siegfried ………. 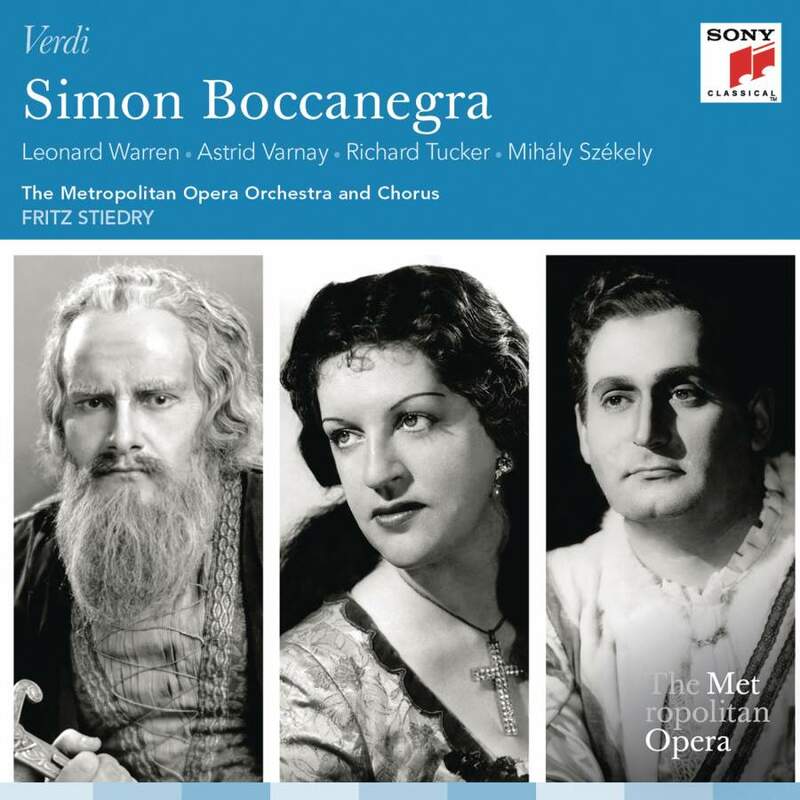 Stefan Vinke *MET Debut The Wanderer … Continue reading "SIEGFRIED"
NABUCCO:Verdi Original Air Date: 12/03/1960 Schippers; MacNeil, Rysanek, Siepi, Fernandi MOD Audio SID.19150640 MacNeil and Siepi are both excellent in the Met’s first Nabucco production. Rysanek gives her all, but really not the right match … Continue reading "NABUCCO"
HAMLET:Thomas Original Air Date: 03/27/2010 Langrée; Keenlyside, Petersen, Larmore, Morris, Spence MOD Video SID.19150641 This is the only Met broadcast of the Thomas work. 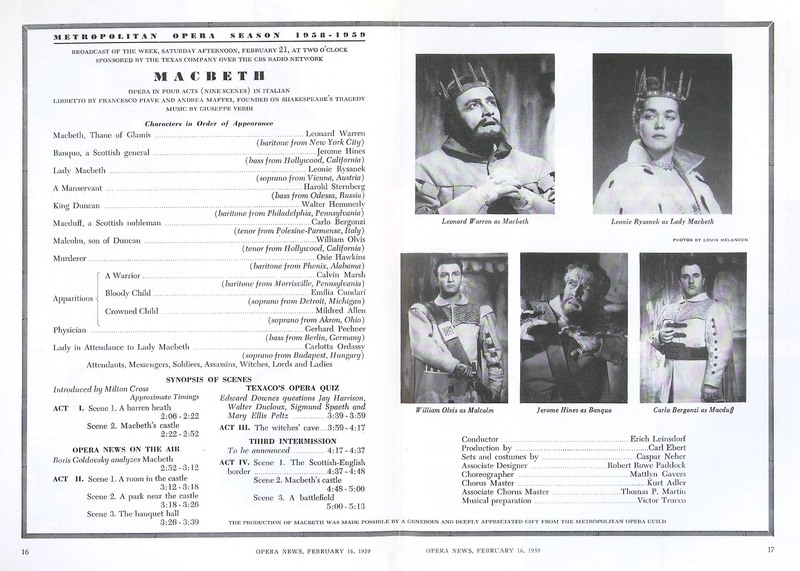 Keenlyside has a commercial DVD in the same production with Dessay … Continue reading "HAMLET"
LA FORZA DEL DESTINO:Verdi Original Air Date: 03/24/1984 Levine; Price, Giacomini, Nucci, Giaiotti, Jones, Fissore SID.19150743 This is a 3 performance group intended to capture the Price Leonora on video ; fall performances had featured … Continue reading "LA FORZA DEL DESTINO"
DER ROSENKAVALIER:Strauss Original Air Date: 02/20/1993 Thielemann; Liang, Tomowa-Sintow, Rootering, Grant Murphy, Schulte SID.19150744 Thielemann conducts a lovely performance with Tomowa-Sintow in her Met broadcast farewell. 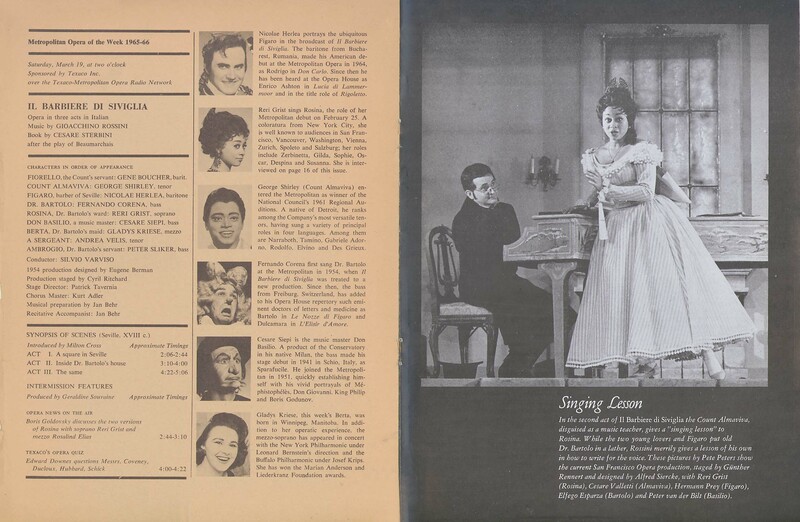 Liang was a two performance replacement for Mentzer and … Continue reading "DER ROSENKAVALIER"
NORMA:Bellini Original Air Date: 03/17/1979 Maag; Verrett, Obraztsova, Cossutta, Plishka SID.19150745 Verrett was a very fine Norma, but this broadcast marks her first in house Met Norma returning after indisposition on the opening night; Marisa … Continue reading "NORMA"
L’ELISIR D’AMORE:Donizetti Original Air Date: 03/14/1981 Rescigno; Pavarotti, Blegen, Bruscantini, Ellis SID.19150746 This cast is represented (at least Blegen and Pavarotti) as far back as 1974 AND 1978 for on Met Opera on Demand (MOoD) … Continue reading "L’ELISIR D’AMORE"
LA GIOCONDA:Ponchielli Original Air Date: 03/31/1962 Cleva; Farrell, Corelli, Merrill, Rankin, Tozzi SID.19150747 Here is why I love the current Sirius service for Met repertory : The fall performances went unbroadcast. 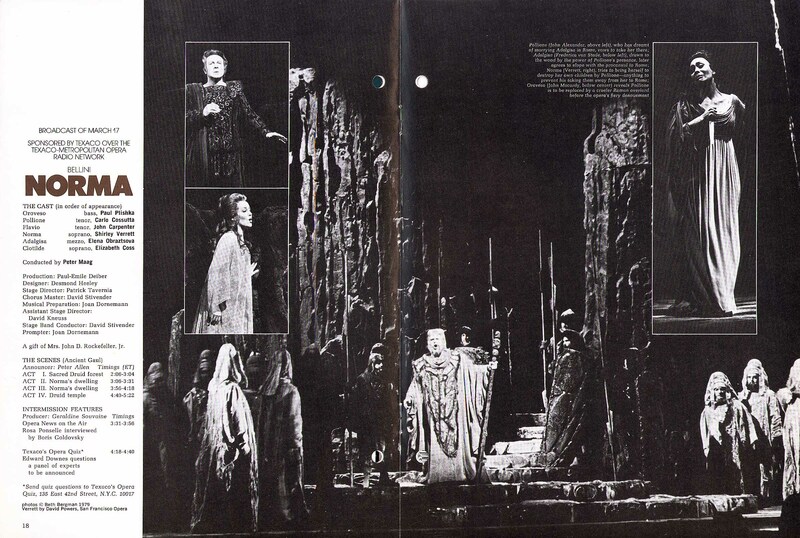 This 19700/71 Hoffmann was … Continue reading "LA GIOCONDA"
NABUCCO:Verdi Original Air Date: 12/03/1960 Schippers; MacNeil, Rysanek, Siepi, Fernandi MOD Audio SID.19150748 MacNeil and Siepi are both excellent in the Met’s first Nabucco production. 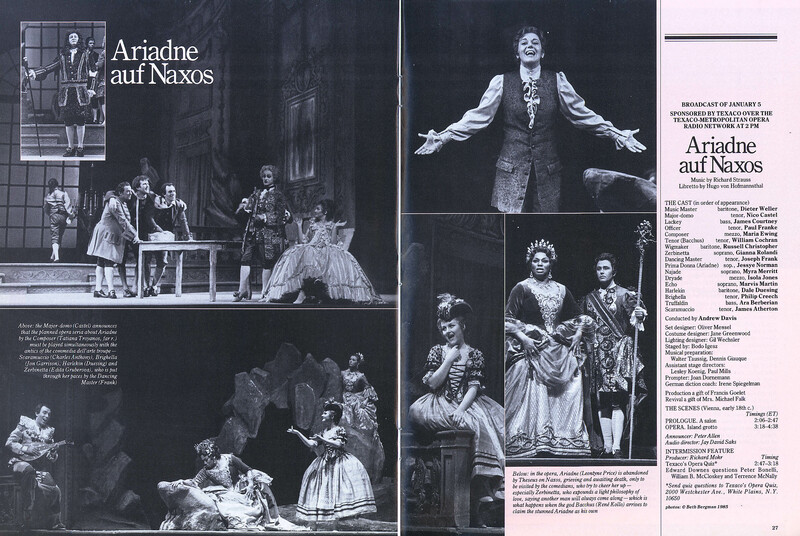 Rysanek gives her all, but really not the right match … Continue reading "NABUCCO"
ARIADNE AUF NAXOS:Strauss Original Air Date: 01/05/1985 Davis; Norman, Cochran, Rolandi, Ewing, Weller, Duesing SID.19160101This is Ms. Norman’s first season at the Met in her most frequent assumption. 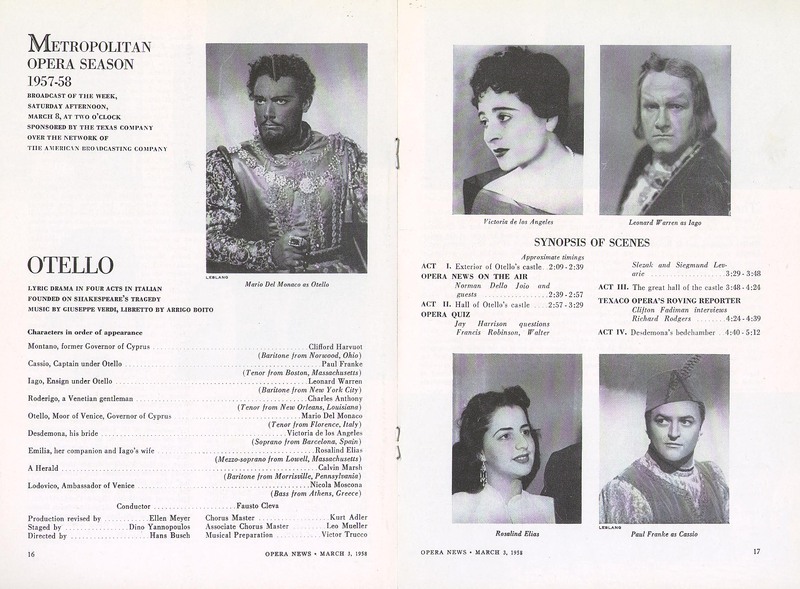 Cochran makes his Met farewell in his … Continue reading "ARIADNE AUF NAXOS"
IL BARBIERE DI SIVIGLIA:Rossini Original Air Date: 03/19/1966 Varviso; Herlea, Grist, Shirley, Corena, Siepi MOD Audio SID.19160102This is Reri Grist’s debut year, and the broadcast comes three weeks later. 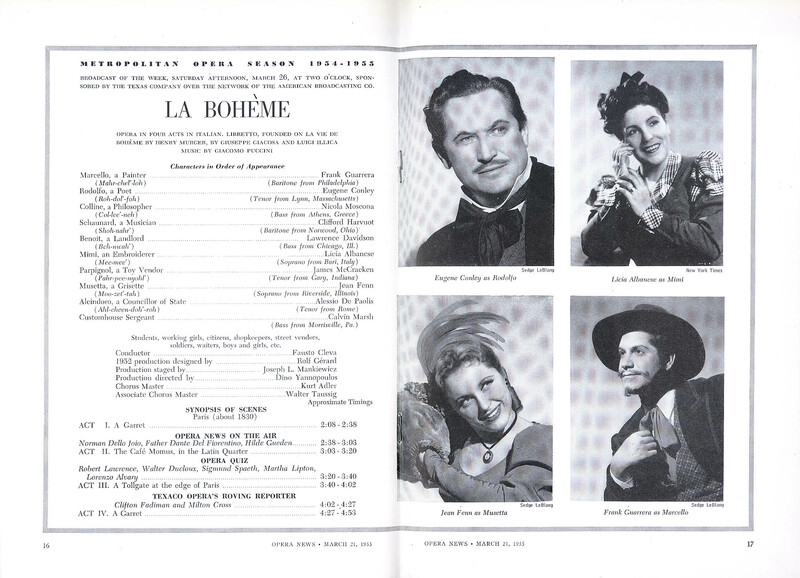 Herlea had some success debuting in … Continue reading "IL BARBIERE DI SIVIGLIA"
AIDA:Verdi Original Air Date: 02/25/1967 Schippers; Price, Bergonzi, Bumbry, Merrill, Hines SID.19160103On paper this performance looks like the dream cast. It is not. 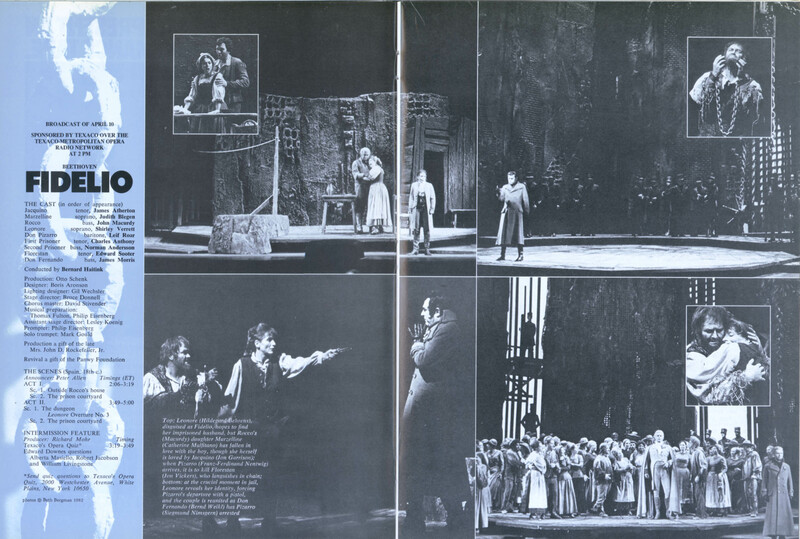 Price who sang possibly her very best performance ever in the opening … Continue reading "AIDA"
ELEKTRA:Strauss Original Air Date: 02/27/1971 Böhm; Nilsson, Rysanek, Madeira, Stewart, Nagy MOD Audio SID.19160104This performance marks Madeira’s Met farewell, and reveals some of the vocal weakness that is surely partly resultant from her illness and … Continue reading "ELEKTRA"
?1435764702 SIMON BOCCANEGRA:Verdi Original Air Date: 01/28/1950 Stiedry; Warren, Varnay, Tucker, Székely, Valdengo MOD Audio SID.19160210Reissued on Sony Classical in the Met’s Verdi box for his bicentennial. 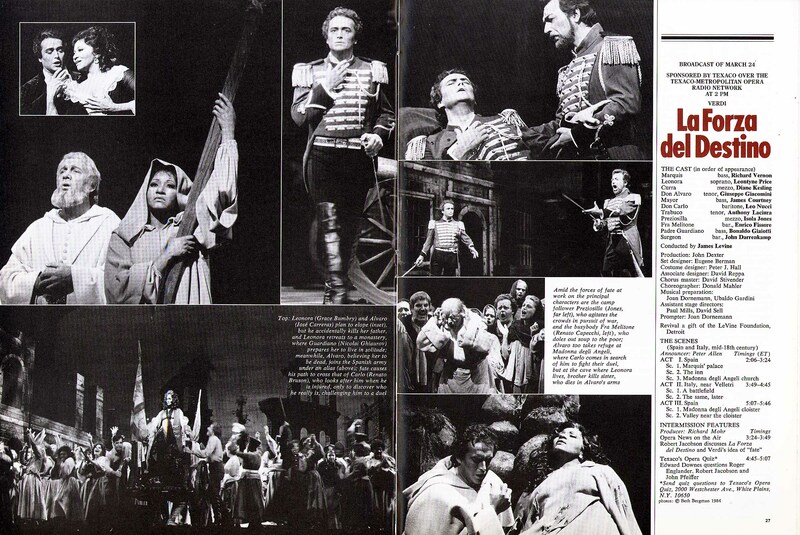 This is Warren’s only broadcast of the title … Continue reading "SIMON BOCCANEGRA"
THE QUEEN OF SPADES:Tchaikovsky Original Air Date: 12/30/1995 Gergiev; Grigorian, Guleghina, Rysanek, Hvorostovsky, Svendén, Putilin SID.19160211This was the year of the new production which had starred Mattila and Heppner along with Rysanek in her last … Continue reading "THE QUEEN OF SPADES"
TOSCA:Puccini Original Air Date: 04/16/1994 Badea; Guleghina, Pavarotti, Morris SID.19160213I don’t keep track of when these three were at their best in these roles. 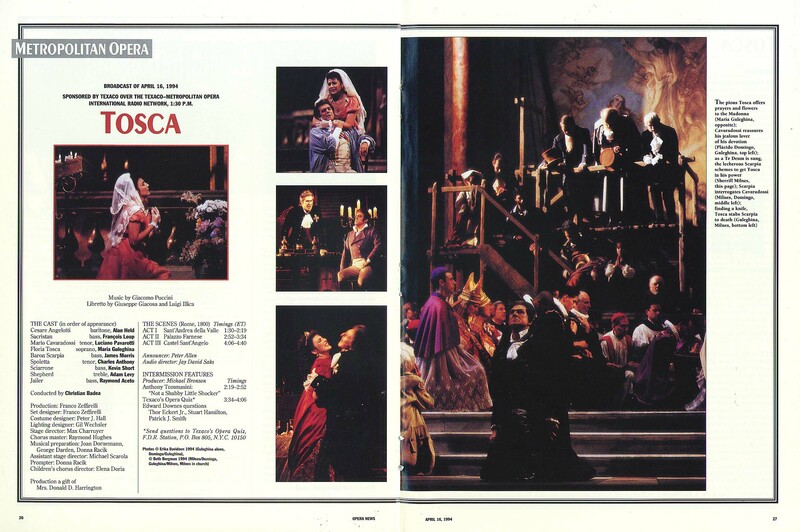 This is Guleghina’s second of four matinee Toscas and she might … Continue reading "TOSCA"
Various:Various Original Air Date: 01/01/9999 Various Artists SID.19160320Various selections between scheduled operas. Siriusxm Radio and web player will show the Composer and Title. 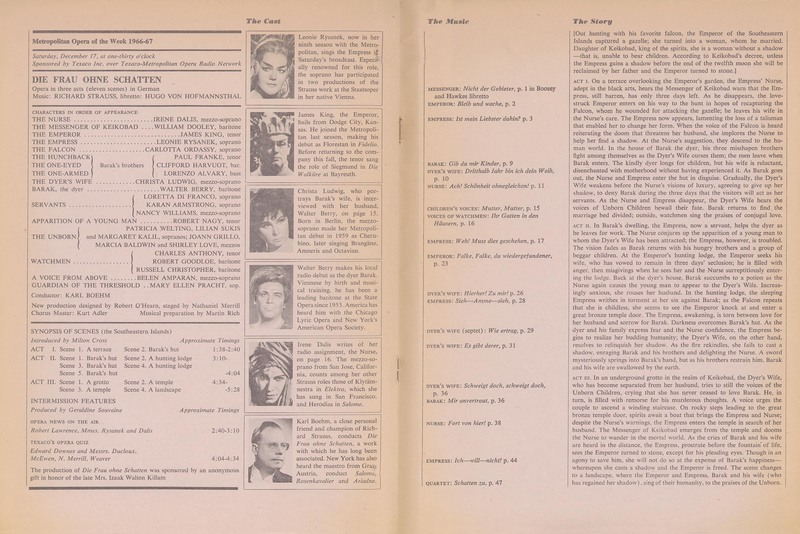 AIDA:Verdi Original Air Date: 02/25/1967 Schippers; Price, Bergonzi, Bumbry, Merrill, Hines SID.19160422On paper this performance looks like the dream cast. It is not. 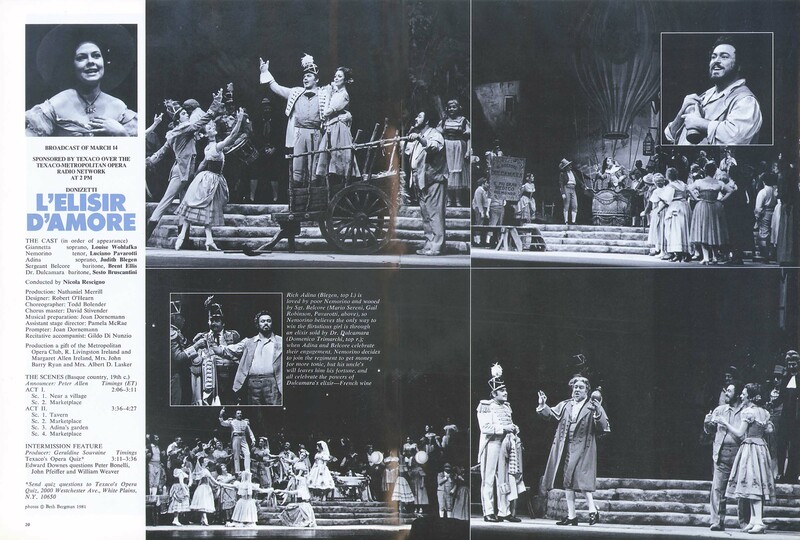 Price who sang possibly her very best performance ever in the opening … Continue reading "AIDA"
ELEKTRA:Strauss Original Air Date: 02/27/1971 Böhm; Nilsson, Rysanek, Madeira, Stewart, Nagy MOD Audio SID.19160423This performance marks Madeira’s Met farewell, and reveals some of the vocal weakness that is surely partly resultant from her illness and … Continue reading "ELEKTRA"
IL BARBIERE DI SIVIGLIA:Rossini Original Air Date: 03/19/1966 Varviso; Herlea, Grist, Shirley, Corena, Siepi MOD Audio SID.19160425This is Reri Grist’s debut year, and the broadcast comes three weeks later. 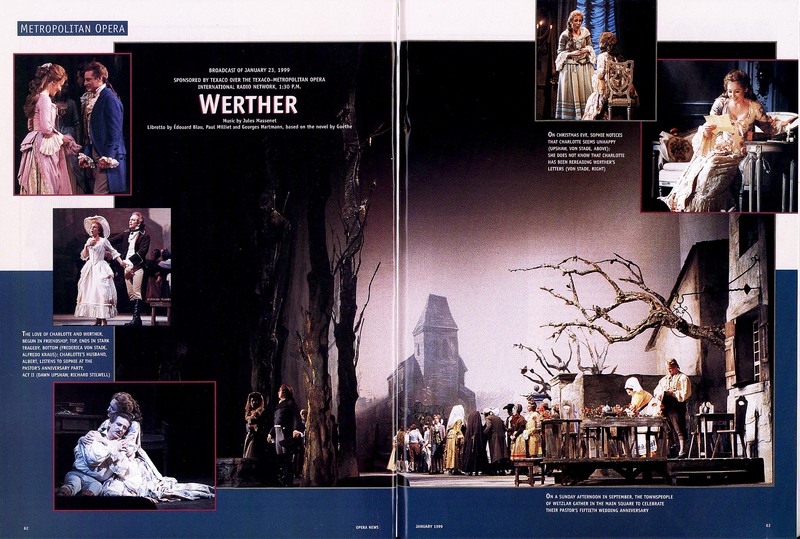 Herlea had some success debuting in … Continue reading "IL BARBIERE DI SIVIGLIA"
?1435764702 SIMON BOCCANEGRA:Verdi Original Air Date: 01/28/1950 Stiedry; Warren, Varnay, Tucker, Székely, Valdengo MOD Audio SID.19160426Reissued on Sony Classical in the Met’s Verdi box for his bicentennial. 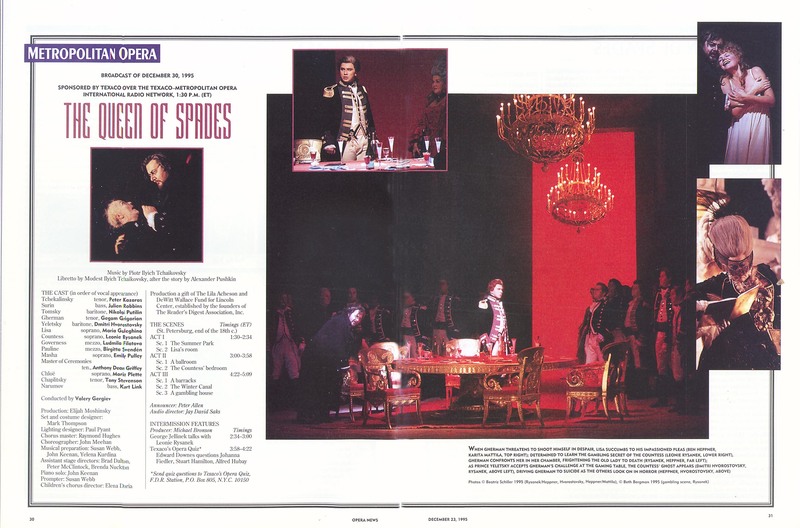 This is Warren’s only broadcast of the title … Continue reading "SIMON BOCCANEGRA"
THE QUEEN OF SPADES:Tchaikovsky Original Air Date: 12/30/1995 Gergiev; Grigorian, Guleghina, Rysanek, Hvorostovsky, Svendén, Putilin SID.19160530This was the year of the new production which had starred Mattila and Heppner along with Rysanek in her last … Continue reading "THE QUEEN OF SPADES"
TOSCA:Puccini Original Air Date: 04/16/1994 Badea; Guleghina, Pavarotti, Morris SID.19160532I don’t keep track of when these three were at their best in these roles. This is Guleghina’s second of four matinee Toscas and she might … Continue reading "TOSCA"
TOSCA:Puccini Original Air Date: 04/16/1994 Badea; Guleghina, Pavarotti, Morris SID.19160745I don’t keep track of when these three were at their best in these roles. 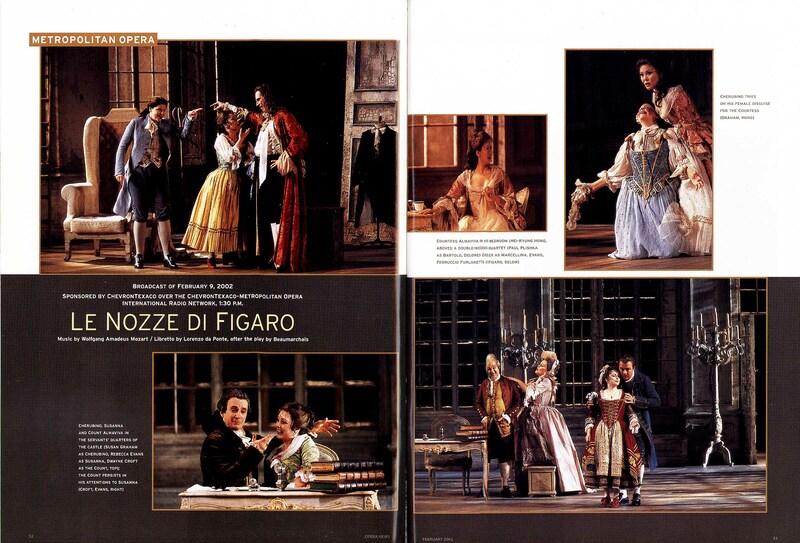 This is Guleghina’s second of four matinee Toscas and she might … Continue reading "TOSCA"